Meet Tillie (her full name is Tillamook Cheddar… yum…cheese…). She is an artist but not any kind of artist — she is a four-legged artist. 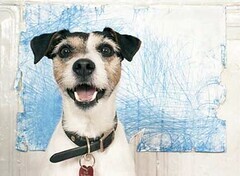 Tillie is a 7-year-old Jack Russell terrier from Brooklyn, NY (pictured here in front of one of her pieces of art) and an abstract expressionist. She uses her paws and her mouth and scratches and chews to produce her masterpieces. Tillie has had 14 solo exhibitions in the US and Europe. She even has a book out, and Tillie has sold more than 100 of her paintings (some selling as high as $2,200). Congrats on the success, Tillie. This entry was posted on Friday, May 11th, 2007 at 3:57 am	and is filed under Dogs, National Dog, Cat & Pet Info, New York, Entertainment About Pets, Misc. Pet Info.. You can follow any responses to this entry through the RSS 2.0 feed. Both comments and pings are currently closed. Wow, Tillie is adorable AND talented!! Awesome! I *had* to comment on this one since it included 3 things I love- Jack Russells, Brooklyn ( I live in NY too) and art! Keep up the great work Tillie!